Bells & Whistles alerts you to "reply to all addresses", "attach files" or "fill blank email subject"! Bells & Whistles can save you from a lot of trouble and unpleasant situations, by notifying you whenever you are about to reply to an email only to the original sender, without copying the other addresses where the email was initially sent. 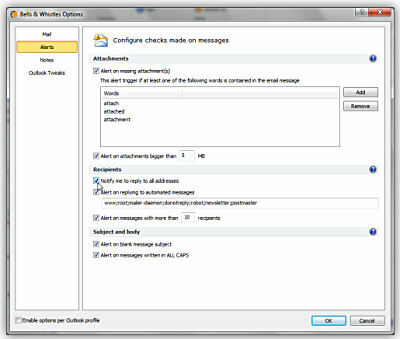 To enable the reply to all monitor, open the Bells & Whistles configuration window (from the Outlook Tools menu) and you will see a section called "Alerts & Notes". You can choose to enable the "Reply to All" Monitor from here. Let's say John sends you an email and he also sends a CC copy to Martin and Fred. When you reply to his email, if you will use the regular Outlook Reply button, the email will be sent only to John. However, Bells & Whistles for Outlook will warn you that there are two other addresses which you may want to include in your reply. If you click Yes on the warning message, Bells & Whistles will automatically alter your email so you will reply to all addresses. Bells & Whistles can also alert you with alerts whenever you forget to attach a file or to enter an email subject when composing an email message. To enable these alerts, open the Bells & Whistles configuration window (from the Outlook Tools menu) and you will see a tab section called "Alerts". You can choose to enable both the subject and the missing attachment alerts or you can enable only one of them. If the missing attachment alert is enabled, then by clicking on the Settings buton, you can define custom words that will trigger the missing attachment alert. Whenever you want to send a new email, Bells & Whistles will silently scan the email for missing attachment trigger words and, if one of them is found, it will popup the alarm. Bells & Whistles will always look for these words only on the text section that you composed, so it will skip previous replies or forwards.